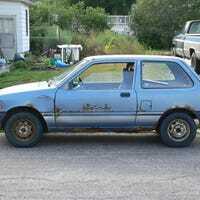 So Oppo I traded my MR2 for a Toyota Corolla SR5 and the SR5 ran but it blew up when I got it home. The sprocket pin was sheared off by the cam and the engine has no compression now. I wish I never went through with this trade and I really want my MR2 back at this point. What can I do? I trade my MR2 for a 86 SR5 turns out the SR5 is worse then my MR2. Classic karma dude. Should of went with the CRX! Would a Bosch O2 sensor work well with my MR2? I says it fits and its the only thing in stock at Autozone. I dont want to wait for one. My current O2 sensor is charred black. Pic related. Hood release button on 05 Sentra? Anyone know where the button is? I dont normally drive this car. Anyone know the size of the bolts that hold the O2 sensor in place on a 88 MR2. I dont know why this Haynes manual isnt telling me xD. So I’m wondering if there is a such thing that covers the engine bay opening that block the rain from coming it. I know the Fiero can change there opening to closed by replacing the vents. Rain and MR2s dont mix. So I was working on setting a new TPS for my MR2 yesterday before work. I didnt finish in time so I left the connection for the TPS just hanging there. I didnt check the weather and it rained last night and that connection was wet. What do I do? Will it short out now? Anyone know where I can find a cheap exhaust for my MR2? Should I search junk yards? I tried to unhook my EGR but I could not remove the thing circled in yellow. That causes a exhaust leak in the manifold and the car ran way worse. Maybe I should of capped it. Does anyone still goof around with vending machines? I remember back in 2007 you could press a certain button combo and get free stuff. My friend showed me in high school. Guys I’ve done alot of work to my car and she went back to being bad. So after 3 shifts it feels fuel starved. So Im thinking it could be exhaust problems. Heres a pic of my exhaust. Would the exhaust cause this and if I remove it would it run better? What kind of 4AGE is this? Where would this be at on a 88 MR2? I should check this as well. Shes getting better I guess lol. I gotta wash her.